Utilizing demonstration from two world-class high jumpers, Calvin Robinson shares tips and drills for coaching high jumping. The first tip is to utilize a well-organized training plan and proper conditioning as a base for success. Technically, Coach Robinson believes the approach is the single most important aspect of championship high jumping. All positive outcomes hinge on a proper and powerful approach. Straight ahead running teaches good acceleration mechanics and a natural step bounce. Curve line runs and S runs are also crucial to the approach of the bar. A more difficult drill is the circle run, which teaches the inward lean and is done in both directions. Full approach jumps include several methods that are trial and error for each athlete. The "skip bounce for height" drill introduces blocking mechanics at take off and ground contact. Another teaching tool is the short run jump. These jumps allow the athlete to focus on proper body posture. Proper posture and acceleration through the take off are the focus. Robinson details bar clearance with a simple "double leg flops off the ground" drill. The same drill can be varied by using a box in front of the bar as athletes get accustomed to jumping high in the air from the box. Robinson concludes with his instruction on the full approach jump. 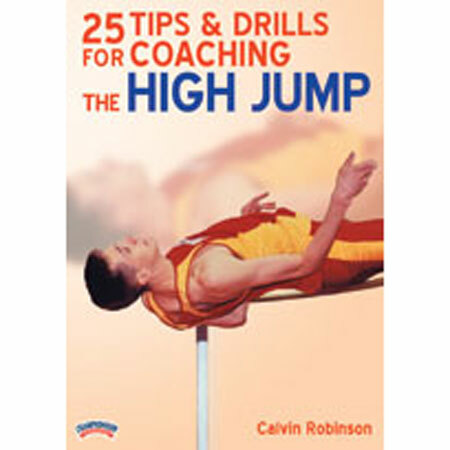 Pulling it all together, Robinson concludes this information packed presentation with world-class demonstration of a dozen proper jumps that serve to pull together and illustrate all of the components of Coach Robinson's instruction.